Sponsor One of Our Concert Rehearsals! The wonderful music of the Twin Cities Gay Men’s Chorus would not be possible without our singers’ dedication to rehearsing. Now you can support their efforts by becoming a rehearsal sponsor. Your donation will cover the cost for room rental and other fees associated with each rehearsal. You can even choose the specific date you would like to sponsor. Your name will be included in our concert program donor pages. You are invited to sit in on your rehearsal and watch the magic happen! Sponsorships may be purchased over the phone or in person at the Chorus Office. You will receive a thank you letter during the month following your sponsored rehearsal. 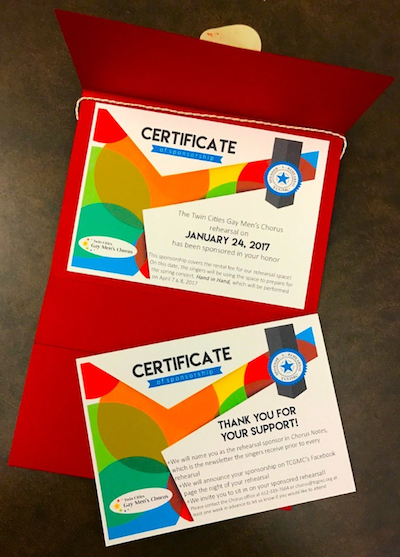 If you are interested in giving a sponsorship as a birthday or other gift, we can send you a special certificate so you have something tangible to give! Order by phone for SEASON 38: call our office at 612-339-7664. Rehearsal sponsorships are a great way to support the Chorus – and they also make great gifts! Support TCGMC While You Shop!